The Best All-In-One Package Available! 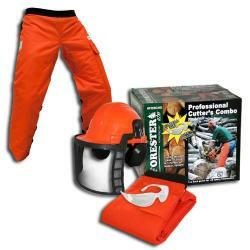 With this package you will get one pair of chainsaw safety chaps, oone helmet with face protection and ear muffs, and a pair of safety glasses. The safety glasses are ANSI Z87.1/UV400 Approved Clear Safety Glasses. The Forester Chainsaw Helmet System meets ANSI/ISEA Z89.1-2009 Type 1, Class E, G & C / Screen meets Basic ANSI Z87.1 Requirements. The ear muffs meets ANSI S12.42 21dB rating. 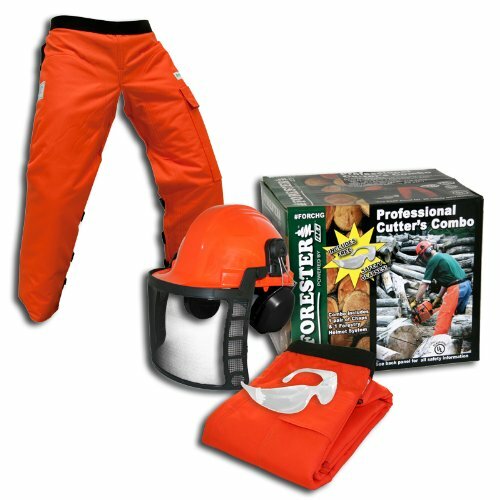 The Forester Chainsaw Safety Chaps are Apron style, adjustable waist and UL Classifies and tested in accordance with ASTM F1897 Standards for leg protective garments. These are our 33"-37.5" inseam chaps and the waist is adjustable to about 40"